“Dalitoy” is the very soul and identity of a Konkani table. Though a humble lentil soup it is the trademark dish that crosses all the socioeconomic boundaries. It is something that every Konkani grew up on, relates with and continues to savor. It reflects the simplicity and the sophistication of our cooking. It completes a homemade Konkani meal when combined with rice, “upkari” -vegetables stir fried with coconut. Konkani cooking, for most part, has evolved from the local produce. Unlike other styles of cooking, it is largely dairy–free. There are various permutations to a given recipe based on the region, the ingredients available and the time of year. However, overall the essence of our cooking remains the same – a unique blend of taste, love and simplicity. The backbone of the Konkani cuisine has always remained what is harvested from the ground. Coconut, rice, lentils, onions, potatoes and red chilies make up the list of ingredients that are interlaced into our culinary lore. Our cuisine boasts of innumerable recipes for vegetables, legumes, greens and grains in endless combinations that call for a little embellishment with coconut. Meat has never played a primary role, in part because most Konkanis were and still remain “Brahmins” and this strictly calls for a vegetarian or in some cases a “Saatwik” diet – vegetarian food without onion and garlic. Even today, when meat is consumed by most Konkanis, it often plays a subordinate role. The dalitoy and an upkari continue to remain the main course while the meat is a cooked and served truly as a side. This however is not the same for fish and other sea food like – shrimps, prawns, crabs and oysters. Seafood has for generations been a part of the staple diet in most households – surprising and quite contradictory to the Brahmin beliefs. This can be attributed to the coastal settlement especially on the Western Indian Coast extending from the Malabar to the Konkan and beyond. Seafood is cooked as a side or as a main course- more a weekend or a weekly once deal. Everyday meal essentially comprises the dalitoy – and it is rightly termed – the “Kuldevu” (KUL = family , DEVU = deity) of our cooking. A Konkani table respects both regional and seasonal produce. Our cuisine speaks volumes of the creativity of the home cooks when faced with – limited ingredients, limited storage and refrigeration facilities and tight grocery budgets. We have found out ingenious and innovative methods of presenting the same vegetable or fruit in different ways and at different times of the year. For example, mangoes are cooked as “Saasam” in combination with pineapples, cooked by themselves as “Ambe Upkari” or churned into chutneys with coconut or pickled into jars. On a similar note Jackfruit is mashed into jelly, turned into “Gharayi” or “Ghare Wada” – also known as “Moolik” and even sun dried as “Ponsa happolo” to be stored for consumption during the monsoon. A mother invited an eligible bachelor home for lunch to meet her daughter. One of the many dishes prepared for the feast was Tendle-Bibbe Upkari. The generous quantity of Bibbo in the dish impressed him. There was hardly any Tendle in the dish. Upon his marriage with the girl, he visited the home and the mother, his mother-in-law now, served the same dish, but now he could see that the number of Tendle in the dish had gone up considerably compromising that of the Bibbo. Over the years the Tendle just seemed to gain an upper hand in its proportion to the Bibbo- since the purpose of getting the daughter married was served the requirement to impress was no longer required. Though the art of baking was not very predominant in early times, the Konkani cuisine incorporated fried bread that we call “Buns” using a yeast-free technique to raise dough – a combination of mashed bananas and buttermilk. This reflects on the fact that we as Konkanis have adopted the word “variety” in everything we do including the food we eat from very early on in our way of living. Religion has been one of the main influencing factors on Konkani cuisine and is something that cannot be overlooked. On ‘holy’ and ‘auspicious’ days, staples like par-boiled rice, onions, garlic and tomatoes are forbidden. Vegetables that are termed “English”, to name a few French beans, cauliflower, peppers, cabbage are refrained from as the food prepared is first offered to the presiding deity. Further, separate utensils are used for cooking and serving on ‘holy’ days and for the rest of the other days. Locally grown yams, tubers, pumpkins and squashes are paired with lentils and coconut to prepare an entirely “Saatwik” meal with white rice. This certainly brings out the uniqueness of our cooking especially around vegetables and grains as many dishes come in two or more versions – one for the holy days and one for the remaining times of the year. In the last couple of decades or so, we as Konkanis have learnt to incorporate various styles of cooking into our kitchens, yet we continue to consume large quantities of the old traditional foods. We continue to endorse foods that have sustained our past generations for eons in spite the modern foods of material comfort. 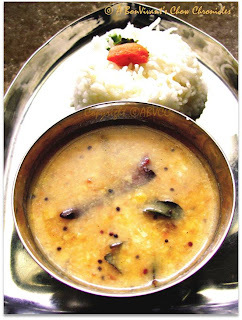 Konkanis today, are in a sense, inadvertently cosmopolitan eaters owing to the fact that we reside all across the globe, yet the love for our food is so deep that a simple meal of rice and dalitoy is always welcome and looked forward to by a Konkani anywhere in the world. The soul of our cuisine is still the foods with which we have grown up and still has an unswerving connection – in the dishes that have an authentic Konkani trademark on it – the Dalitoy, the upkaris, the saghles, the sukkhes and the randhayis. Just as our language, our cuisine forms an integral part of our culture and traditions. We as the Konkani people need to understand our past, cherish it in the present and preserve it for the future. This article is an effort to throw light on the Konkani cuisine- An introductory attempt to preserve and highlight the overall breadth and wealth of our cooking to the present generation and many more to come. Nice work. The story of bachelor and bibbo was funny. Eskay says that the seafood has for generations been a part of the staple diet in most households – surprising and quite contradictory to the Brahmin beliefs. This can be attributed to the coastal settlement especially on the Western Indian Coast extending from the Malabar to the Konkan and beyond. Seafood is cooked as a side or as a main course- more a weekend or a weekly once deal. Everyday meal essentially comprises the Dalitoy – and it is rightly termed – the "Kuldevu" (KUL = family, DEVU = deity) of our cooking. I maintain on one count that the seafood has become an identity of Gaudd Saraswat Brahmins. It was so even before they landed on the territory of Konkan. In Goa, a 'neez goemkaar' means a genuine Goan who can eat comfortably, a fish known as Kallee'. In Goa, a fair is organized annually, which is known as 'Saraswat Food Festival' People from all communities throng there to cherish their childhood memories. Eskay contains that religion has been one of the main influencing factors on Konkani cuisine and is something that cannot be overlooked. My childhood, reminds me that my community even did not tolerate vegetable like tomato. On 'holy' and 'auspicious' days, staples like par-boiled rice ('Ukddo', which is also known as 'ushnno' among the Bengalis), onions, garlic were forbidden. The term 'religion' was not, and is not synonymous of the term, which is being accepted these days. Hindu approach considers that religion means mentality, nature of person/s, duty, temperament and way of life. Apparently, it is a flexible view point. The western approach is very much rigid because it is dogmatic and canonical. We should be a bit cautious about these terms while we bring them into usage. I await more and more delicious articles from Eskay. Very informative post. We might be more and more cosmopoliton eaters but authentic konkani food still rules. To us konkanis, dalitoy is not just a food item. It is a way of life!